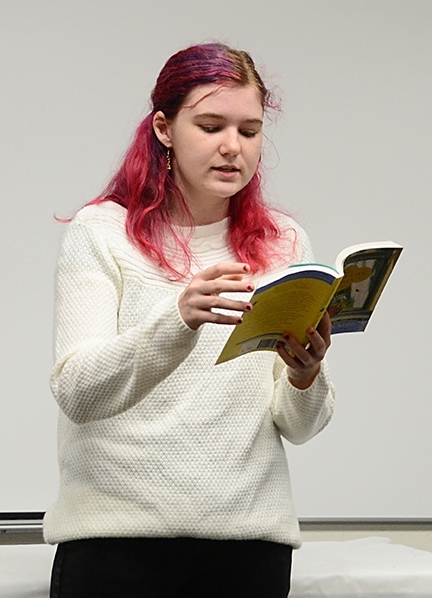 Kailey Mauldin, 15, a sixth-year 4-H'er and member of the Elmira 4-H Club, Vacaville, delivered an award-winning presentation on Sue Monk Kidd's New York Times'bestseller, The Secret Life of Bees. 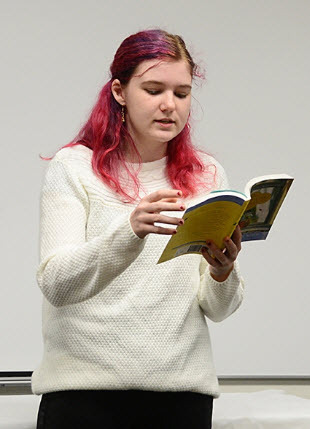 Kailey read and interpreted passages, and answered questions from evaluators JoAnn Brown, April George and Kelli Mummert. A particularly sobering aspect of global environmental degradation is the rapid decline of insect populations. One recent study in the journal Biological Conservation estimated that 40 percent of the world’s insect species could go extinct within the next three decades, owing to habitat loss due to agriculture and urbanization, pesticides, climate change and other insults. Quite apart from playing havoc with the food web, declines in certain insect populations threaten the bugs’ crucial role as pollinators. Humans rely on insects to pollinate more than 30 percent of food crops—a huge service that nature provides free of charge. That makes it essential to understand which insects are pollinating which plants—even to the point of tracking individual pollen grains from flower to flower via their insect vectors. But a robust, useful system for labeling the tiny grains, which are subject to the vicissitudes of wind and weather in addition to the mazy paths of insects, has been fiendishly difficult to devise. Now, a pollination biologist in South Africa has hit upon a novel answer: tag the pollen with fluorescent quantum dots (Meth. Ecol. Evol., doi: 10.1111/2041-210X.13155). Quantum dots (QDs) are luminescent semiconductor nanocrystals that, when excited by light of a specific wavelength (such as UV), re-emit at visible wavelengths, with the specific emission wavelength depending on the size of the quantum dot. They’ve found use in a wide variety of contexts including biomedical study (see, “Quantum Dots for Biomedicine,” OPN, April 2017). Indeed, the pollination biologist behind the new study, Corneile Minnaar of Stellenbosch University, South Africa, reportedly got the idea for pollen tracking with QDs from a paper on their potential use in targeting and imaging cancer cells. To use QDs to track individual pollen grains, Minnaar—who began the work as a Ph.D. student at Stellenbosch, where he’s now a postdoc in the lab of pollination biologist Bruce Anderson—first had to figure out how to tie the dots to the pollen. To do so, he began with commercially available, nontoxic CuInSexS2−x/ZnS (core/shell) QDs with four different emission wavelengths: 550 nm (green), 590 nm (yellow), 620 nm (orange) and 650 nm (red). Next, Minnaar chemically tied the QDs to an oleic‐acid ligand molecule that would latch onto the lipid-rich “pollenkitt” that surrounds pollen grains—the same substance that makes pollen stick to the coats of pollinators like honeybees. Minnaar then took the lipid-doped QDs and dissolved them into a volatile hexane solvent, and micro-pipetted drops of the solvent onto the pollen-rich anthers on flowers of four different plant species. The ligand-bearing QDs quickly stuck to the pollenkitt on the grains, as expected, and the volatile hexane rapidly evaporated away. The result: flowers packed with potentially trackable, QD-labeled pollen. Minnaar tested the ability of the pollen grains to hold onto the QDs by agitating samples in an ethanol solution, and found that the grip was firm. Also, in a controlled, caged experiment, he trained honeybees to move from tagged to untagged samples of a particular flower species, and found that labeling the grains with the QDs had no effect on the grains’ ability also to stick to the bees. The general robustness of the system suggests it could serve well in tracking pollinators in wild settings, quantifying parameters such as pollen loss and the importance of certain species to sustaining specific kinds of plants. That said, there are still a few limitations, according to the paper. One is that right now, “there are only four commercially available, distinguishable quantum dot colors in the visible range,” which could limit studies to only four plant species at a time. And, while initial tests were encouraging, more work needs to be done to determine whether the labeling and application process has effects on pollen viability that could complicate experiments or affect pollinator behavior. One other, unavoidable drawback, notwithstanding Minnaar’s clever microscope setup, is the sheer labor of counting and checking the glowing pollen grains to amass experimental data. That's a task likely to while away the hours of grad students for years to come, irrespective of the technique used to label the grains. “I think I've probably counted more than a hundred thousand pollen grains these last three years,” Minnaar said. Theodore Payne Foundation to Speak at LACBA Meeting Monday, March 4th, 2019! You won’t want to miss our LACBA Monthly Meeting Monday, March, 2019! Our main speaker is from the Theodore Payne Foundation. The Theodore Payne Foundation inspires and educates Southern Californians about the beauty and ecological benefits of California native plant landscapes. LACBA meets at the Mount Olive Lutheran Church, 3561 Foothill Boulevard, La Crescenta, CA 91214 (In Shilling Hall) Committee Meeting: 6:30pm / Membership Meeting: 7:00pm. Please bring something for the raffle! 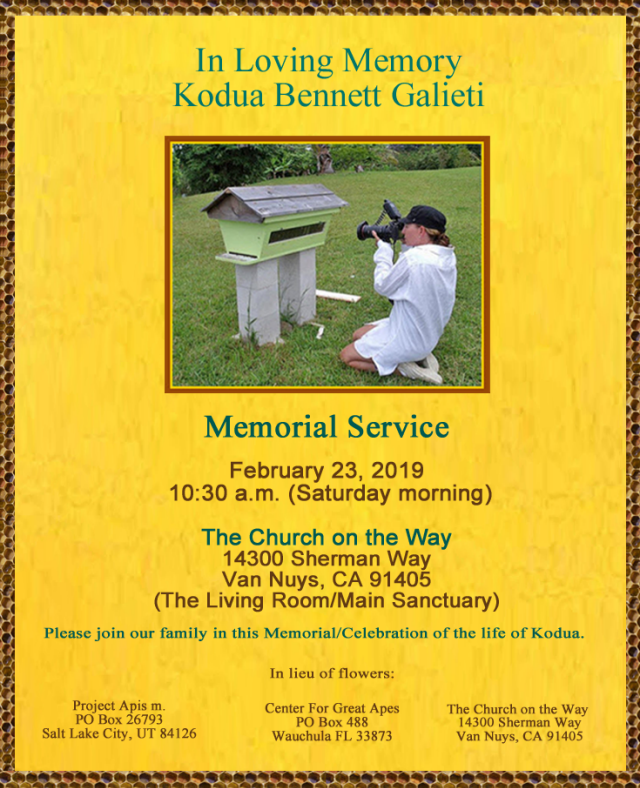 **The meetings of the Los Angeles County Beekeepers Association (LACBA) are open to the public. Everyone is welcome. Please see the draft agenda in the email below and send any requests to add or revise agenda items to our president president@losangelescountybeekepers.com prior to the meeting. 7 minute - Experienced beekeeper - My first 2 years as a beekeeper; mistakes, trials, tribulations, and problems. What are you seeing in your hives? What’s Blooming in your area? Our second class of the year. Time: Gates and Check in open @ 8:30am. Class Starts @ 9am and will run until Noon. Non-native honey bees have established robust feral populations in San Diego, such as the pictured swarm. Honey bees currently make up 75 percent of the observed pollinators in San Diego, considered a global biodiversity hotspot. Hike around the natural habitats of San Diego County and it becomes abundantly clear that honey bees, foreign to the area, are everywhere. In a study published last year, researchers at the University of California San Diego found that honey bees are the most widespread and abundant pollinators of wild plants in the world, with the San Diego region having exceptionally high honey bee visitation on native plants — roughly three-quarters of all observed pollinators. 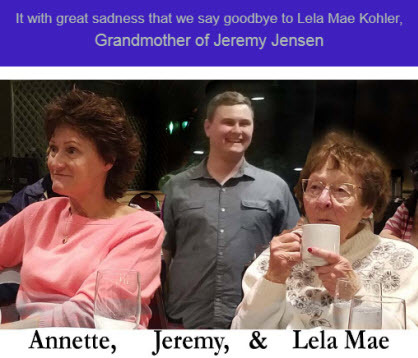 The new study by Keng-Lou James Hung, Jennifer Kingston, Adrienne Lee, David Holway and Joshua Kohn of UC San Diego’s Division of Biological Sciences is published on Feb. 20 in Proceedings of the Royal Society B. The honey bees’ monopoly over the most abundantly blooming plant species may strongly affect the ecology and evolution of species that are foundational to the stability of the region’s plant-pollinator interactions, the researchers said. Native to Europe, the Middle East and Africa, honey bees were introduced to North America in the 1600s. 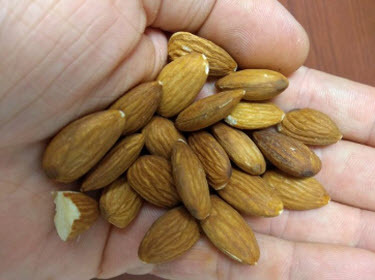 They spread in California after the state’s gold rush in the mid-1800s. In San Diego, the great majority of honey bees foraging in natural systems are both feral and Africanized (an aggressive hybrid of the Western honey bee). Behind the honey bees’ ability to preferentially target the most rewarding plant species is the fact that they employ social communication to “spread the word” when flowers with rich pollen and nectar resources are available in abundance. Most pollinating insects native to the area are solitary, and thus not capable of such communication. Native bumble bees made up only 0.2 percent of insect visitors to flowers, perhaps due to competition with honey bees. These findings highlight the importance of considering the honey bee’s unique foraging behavior when evaluating its ecological impact on native species. Vernier compared the CHC profiles of bees on the day they were born and at 1 week, 2 weeks, and 3 weeks old. The 3-week-old bees had significantly different profiles than their younger siblings.A 3-week-old foraging bee also has a very different job to support the hive than a younger bee — one who spends her time as a nurse caring for bee larvae and building the waxy honeycomb structures in the hive. The bees in this study were kept in two different locations: Tyson Research Center, the environmental field station for Washington University in St. Louis, and an amateur beekeeper’s private residence in University City, MO. Funding for the project was provided by the National Science Foundation under grants NSF DGE-1143954, IOS-1322783, IOS-1707221 and IOS-1754264. What a bee! 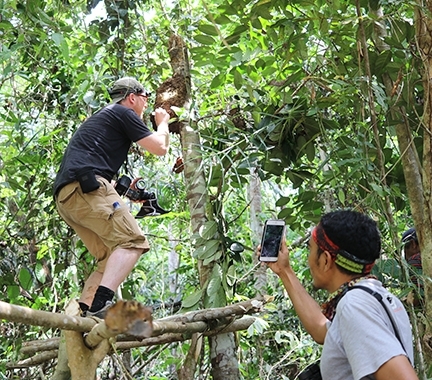 Lost to the science since 1981, the world’s largest bee (Megachile pluto) has been rediscovered on an island in Indonesia. Its non-scientific name is Wallace’s giant bee, named for British entomologist Alfred Russel Wallace, co-discoverer of the theory of evolution by natural selection … and giant it is! With a 2.5 inch wingspan, this beast of a bee towers over its more familiar brethren. The female is pictured here — males of the species are smaller, something not uncommon for insect species. The bees make homes for themselves inside termite nests, walling themselves off from the insects with resin and other materials. Their large jaws come in handy here, put to use scraping the resin from trees to be rolled into balls and flown back to their nests. 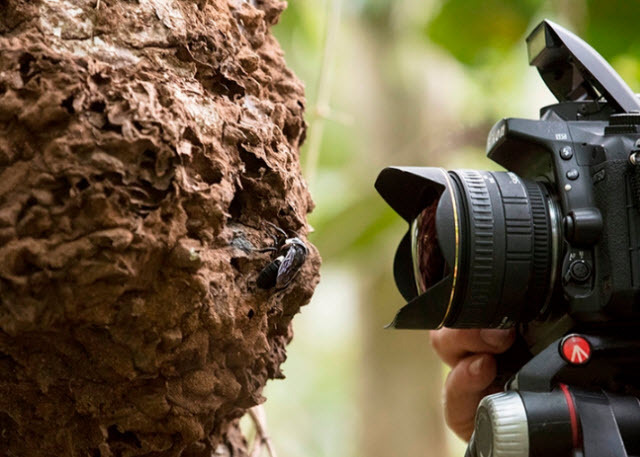 Natural history photographer Clay Bolt has the distinct honor of being the first person to photograph a living specimen of the giant bee in decades. For bees and other social insects, being able to exchange information is vital for the success of their colony. One way honeybees do this is through their waggle dance, which is a unique pattern of behavior, which probably evolved more than 20 million years ago. A bee's waggle dance tells its sisters in the colony where to find a high-quality source of food. However, in recent years, people have begun to study the actual benefits of this dance language. Biologists at the University of Lausanne in Switzerland and at Johannes Gutenberg University Mainz (JGU) in Germany have now shed some new light on the benefits and disadvantages of the bee dance. 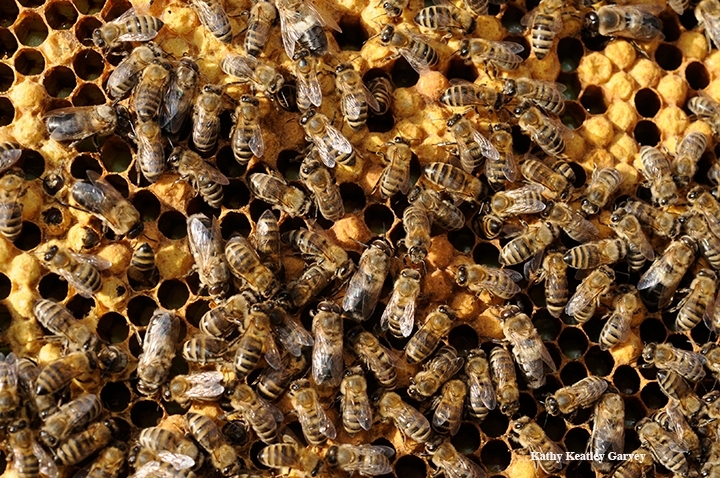 "To our surprise, we found that bee colonies are more successful at collecting food if they are deprived of their dance language," reported Dr. Christoph Grüter, a behavioral ecologist at Mainz University. One possible reason may be human-induced habitat change. Together with his colleagues in Lausanne, Grüter conducted experiments over several years to examine the effect of the dance language on a colony's success. 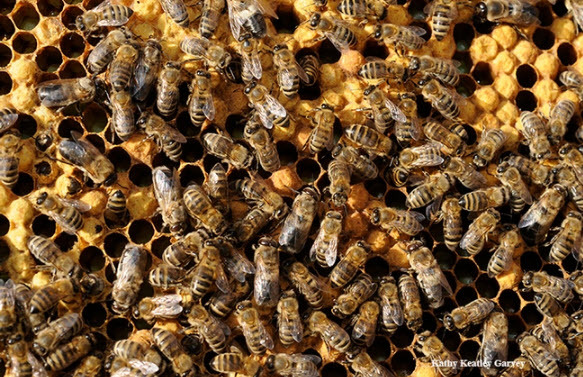 There are about 10 species of honeybees that communicate through waggle dancing. However, the vast majority of bees, i.e., more than 500 species of highly social, stingless insects, have no dance language. 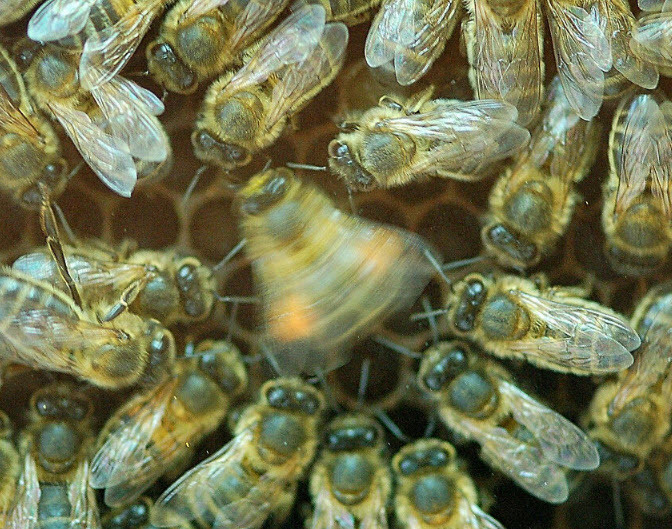 Thus, Grüter was interested in the benefits the waggle dance brings to colonies, not least because, as a communication strategy, it is relatively time-consuming. Some waggle dances can last only a few seconds, while others may take up to five minutes. 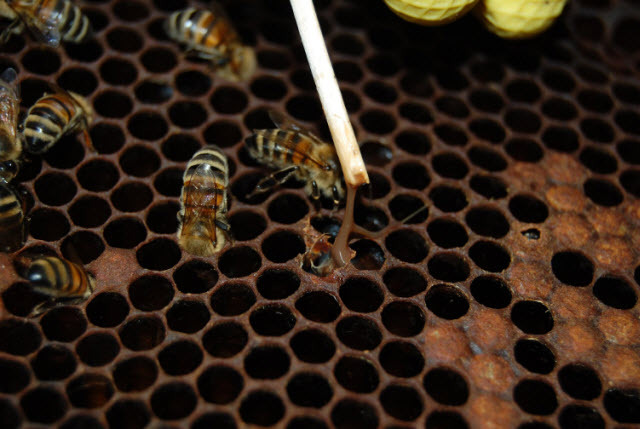 In the experiments, the scientists manipulated the conditions influencing some of the bee colonies in order to confuse and disorientate the dancing bees. Performed under such conditions, the waggle dance no longer made sense to its bee audience. To create these conditions, light was prevented from falling on the honeycombs, and they were also turned into a horizontal position, preventing the bees from using gravity to orientate themselves. Another particularly important aspect was to take into account their ability to memorize the location of food. "Bees foraging for food have an excellent memory and can recall a rich feeding spot for several days," explained Grüter. Thus, the research team had to prevent foragers performing the waggle dance for 18 days to ensure they could not use their memory to tell other bees where to fly to find the excellent sources of food. Foraging bees are older than other colony members. In their final phase of life, they no longer work in the hive, but go out to collect nectar and pollen. Typically, they are in the last 18 days of their life. The conclusion is that some bees, such as the Buckfast bee, a 100-year-old cross-bred western honeybee used in this study, may do better without social communication. Grüter believes that the environment and the availability of food play an important role. If there is a large apple tree in full bloom nearby, then waiting for information on its location is probably a good strategy. If, on the other hand, there is only a sparse scattering of flowering plants on balconies or roadsides, it may be better to leave the hive sooner and forage independently. "In our opinion, the behavior we observed can be primarily explained in terms of how much time the bees save," said Grüter. The idea that bees may be capable of evaluating the quality of information in a dance is one that Grüter wants to investigate more closely in the future. He is also planning to repeat the experiments in the Mainz area under different conditions—in urban and rural areas and at different times of the year. For the first time, researchers have shown that Asian elephants in Sri Lanka are scared of honey bees, much like their African counterparts. Playbacks have been used for many years to explore the behavioural responses of African elephants to a suspected natural threat. However, the research published in Current Biology, is the first time this technique has been used to record how Asian elephants react to the sound of bees. The study, led by Dr Lucy King, a Research Associate with the Department of Zoology at Oxford University and head of the Human-Elephant Co-Existence Program for Save the Elephants, showed that Asian elephants responded with alarm to the bee simulations. They also retreated significantly further away and vocalised more in response to the bee sounds compared to controls. In collaboration with elephant scientists from Cornell University, Save the Elephants, Trunks and Leaves, Disney’s Animal Kingdom and University of Peradeniya the team now hope that beehive deterrents, used so successfully to ward off African elephants from rural farm lands, can be applied to prevent Asian elephant populations from raiding crops. The study was performed in Udawalawe National Park, which has an exceptionally large elephant population. 'Udawalawe is a microcosm for the issues Asian elephants face, because it is practically encircled by agriculture and settlements. This study takes the first step in offering a new way of addressing the conflicts that arise as a result,' said Dr. Shermin de Silva, Director of the Udawalawe Elephant Research Project. In partnership with the Sri Lankan Wildlife Conservation Society and Australia’s Newcastle University, a network of 10 trial beehive fence projects are presently being tested to see if they can reduce human-elephant conflict for rural farms in central Sri Lanka. 'We have a wonderful community of willing farmers there who are helping us understand if beehive fences could work to reduce conflict in this intensely high human-elephant conflict zone,' said Dr King. 'Although beehive fences may not completely stop elephant crop-raids the honey bees provide other benefits to the farms in the form of pollination services and a sustainable income from honey and wax products'. 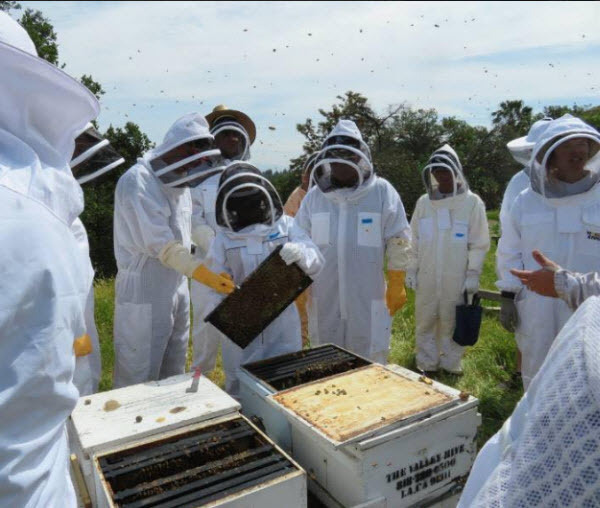 The initiative is already harvesting honey from the beehives and four beekeeping workshops have been held to boost beekeeping knowledge and honey processing skills. Further Asian beehive fence collaborations are being formed with scientists in Thailand, India and Nepal. (Note: The Western Apicultural Society is making a collective and conscious shift to be an organization that builds community around bees. This will be very apparent at our upcoming conference (July 11th-14th in Ashland, OR)... bee there!! In the meantime, check out this very cool project that aims to create community and build income for folks who have fallen on hard times in Appalachia! 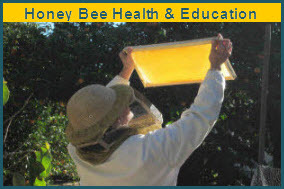 Get your 2019 Honey Bees from a local beekeepers. 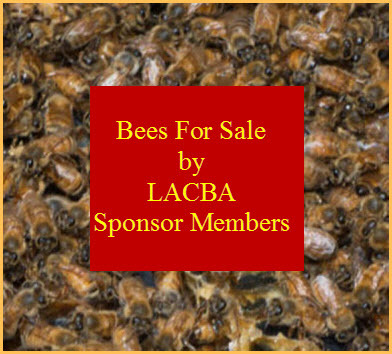 The following LACBA sponsor members have honey bees for sale. Place your order NOW - so you’re not bee-less come bee season!!! Sure, dogs may not always wear capes, but they have a superpower — their superior sniffers. “They have up to 300 million olfactory receptors in their noses, versus only about 6 million for us. The part of their brains dedicated to interpreting smell is about 40 times larger than ours,” says Michael Nappier,an assistant professor at the Virginia Maryland College of Veterinary Medicine. “While we might notice if our coffee has a teaspoon of sugar added to it, a dog could detect a teaspoon of sugar in a million gallons of water, or two Olympic-sized pools,” writes Alexandra Horowitz, the author of Inside of a Dog: What Dogs See, Smell, and Know. Bazz may be Australia’s first bee-sniffing dog, but the tradition dates back further in the US. The Maryland Department of Agriculture (MDA) has kept a full-time “bee dog” on its staff since 1982. The only state agency in the nation that trains canines to detect AFB, the MDA keeps tabs on roughly 3.4 percent of the country’s pollinators, according to the USDA. The dogs assist with the state’s apiary inspections, a free service provided for commercial beekeepers and hobbyists. “Mack is our fifth bee dog,” Preston says. The 4-year-old yellow Lab is the only certified dog in the US that can sniff out “brown snot gunk."